Throughout cultures far separated by geography, climate, and time, the egg has been a symbol of life only rivaled in use by the sun. The emergence of life from a seemingly inanimate, white, featureless object soon became naturally associated with the bounties of spring emerging from the hardships, and cold, of the winter. Not only was the egg tied to the dawn of spring, it was also, for obvious reasons, a metaphor for the emergence of life itself. The egg was seen as something to be revered, and beliefs eventually formed that to decorate, and protect an object of such sacredness, an object containing life itself, would bring good fortune and protection into ones own life. No one can be certain which culture first decided to decorate eggs. Both the Romans and the Egyptians were known to have works of art revolving around the egg thousands of years before Christ. However neither of the societies can match the reverence toward the egg practiced by the Trypillians. The Trypillians were a group of people, nearly a million in number, that lived from 5,500 BC – 2750 BC, in what is now Ukraine and Romania. 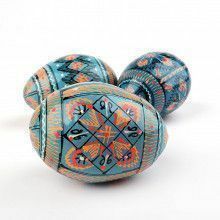 No egg from this ancient culture remains, but symbols still painted on eggs by Ukrainian artists today can be dated back to Trypillian culture. If they didn’t start the trend, than the Trypillians certainly championed the belief that writing on the symbol of life would directly affect the fate of the people. The word "write" comes into some importance as the word for the decorated eggs of Trypillian influence is pisanki (or pisanka as a singular), which is derived from the Slavic verb "pysati" which translates into "to write," and that’s exactly what’s done to these eggs, they are written on. To wish for some event, or occurrence, or blessing, it would be written on the object from which life arrives: the egg. It was way for humans to write their own destiny in harsh and unforgiving times. Pisanki were not just decorations and ornaments, they were talismans, charms to ward off the evil, and attract the good in the world, and the tradition, legend, and creation was passed down from generation to generation, dating back thousands of years. Pisanki were traditionally created by women, usually alone at night. To impart the powers that the egg supposedly carries with it, the artist needs a calm, positive, state of mind. The traditional creation method starts with an egg, (of course) and also a utensil called a "kistka," a sort of stylus filled with beeswax, the word translates from Slavic into "little bone," as that was what was originally used. Designs placed with specific intent are then written on the egg with the wax. Next the egg is placed in the dye, and the wax is removed. The removal of the wax leaves a portion of the egg uncolored by the dye, thus creating a design. The process is then repeated, with the lighter colors being used first, and the darker colors on top of them. The simple technique mirrors our path through life; little by little we live our lives towards the goal of leaving a mark on the world, and on the lives of others, and day by day the brightness and purity of our youth grow darker – just as little by little the bare egg becomes a Pisanki, which grows slightly darker with each layer of dye applied. Each egg usually features one, or two dominant colors. The color depends on the situation for which the egg is created for. If it is to be given to a young child, or in celebration of a birth, the egg features a light color representing the bright future that lies ahead. Brown is used to celebrate the gifts of the earth, such as a good harvest, while green is to celebrate a renewal, or a new start. A black and white egg is for mourning the death of the departed, symbolizing the transition from the purity of life to the black of death. Along with colors, each design has its own special meaning, and use. Some designs were reserved for special occasions, such as the forty triangles design. This, unsurprisingly, features forty triangles, each bringing good fortune to a different tenet of marriage marriage in early Ukrainian society. Symbols like the pine leaf are used to impart longevity and health onto the eggs recipient. While a ladder, or steps are for a safe trip into the afterlife. 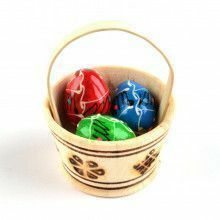 You can learn more about the various symbols of pisanka here, http://www.learnpysanky.com/symbols.html. Just as the pisanki can bring good fortune though, if it is not taken care of, or it is broken, it can bring bad luck. Legend has it that if a woman gives an unfinished pisanka to a man, then he will go bald! Eventually Christianity made its way to Ukraine, Romania, Moldova, and all the lands of former Trypillia. The eggs fit in with Christian teachings as Mary Magdalene once offered a color changing egg to Emperor Tiberius, explaining that Christ’s resurrection is possible, because all things are possible through Him. 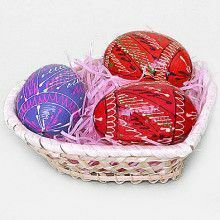 Christian belief also fit in perfectly with the eggs, as soon pisanki were designed to impart the guidance of Jesus as opposed to the protection of Pagan Gods. The connection with Christianity would eventually get the practice of pisanka creation banned under Soviet rule. However the art is again thriving in the modern day. Pisanki continue to evolve today, though many of the designs are still traditional, modern paints allows for a more vibrant result. Often carved wood is used so that your pisanka can impart good fortune for many years. Pisanka were so important to culture of ancient Ukraine that there is a legend that says at the center of the earth is a dragon bound by many chains. It is continuously trying to escape from its prison, but with each pisanka created, the chains grow stronger. So, what is the morale of the story? Stock up on pisanki!